It seems that we're back on the horse with our release schedule, at least for now. 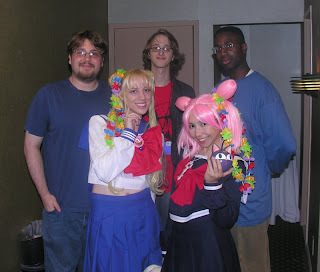 This episode was recorded at MangaNEXT, which started three years ago as the first ever manga-centered convention. An hour or so before I left the con, I pulled together a motley crew of podcasters, bloggers, and (apparently) some random people who were hanging out with us. As such, this episode features a cacophony of awesome sound that your ears just might not be ready for. Hosts include: Evan "Vampt Vo" Minto, Scott VonSchilling of AnimeAlmanac, DJ Ranma S and Kuro Usagi of the Anime Jam Session podcast, Scott's friend Greg, and two Sailor Moon cosplayers who DJ Ranma invited into the podcast. Show notes? You want SHOW NOTES? The conversation was rambling and unstructured, so how's about I don't give you show notes? Since there aren't any notes, though, you should probably know that Frank Pannone (who kindly provided the opener) is the Managing Editor at anime company Media Blasters. Don't you worry, supplementary links can still be found after that big fat break. Oh, and next episode MitchyD and I are talking about Mirror's Edge. It's already recorded, so get ready!